Joe Ledbetter, president, left, and Tim Piersant, vice president, co-owners of the Chattanooga Whiskey Company, appeared before the Hamilton County Commission on Thursday. The owners asked for the commission's support as they appeal to the Tennessee Legislature to change state law and allow them to make their product in Hamilton County. Supporters listen as Joe Ledbetter, president, and Tim Piersant, vice president, co-owners of the Chattanooga Whiskey Company, appear before the Hamilton County Commission on Thursday. The owners asked for the commission's support as they appeal to the Tennessee Legislature to change state law and allow them to make their product in Hamilton County. 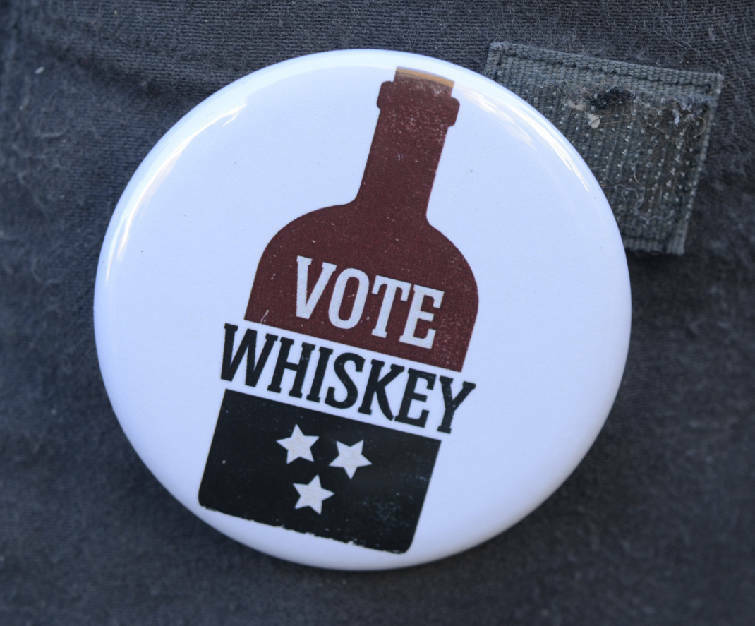 Chattanooga Whiskey Co. supporters wear buttons that say "Vote Whiskey" as they show up in support as company owners appeared before the Hamilton County Commission in this file photo. The Hamilton County Commission will vote whether to adopt a nonbinding resolution to the Tennessee General Assembly requesting the state law to be amended to pave the way for liquor distillation. If accepted, the state could choose to include the county in the list of those permitted to decide for themselves whether they will allow distilleries in their borders. Supporters of Chattanooga-made whiskey bottlenecked into the security line at the Hamilton County Courthouse on Thursday morning. Sporting pins stamped with the Chattanooga Whiskey Co.'s "Vote Whiskey" logo, about 100 people funneled into the County Commission chamber, which is usually empty for agenda sessions. They were backing Chattanooga Whiskey Co. leaders Tim Piersant and Joe Ledbetter, who hoped to persuade commissioners to get Prohibition-era laws changed and bring liquor manufacturing back to the county. When Ledbetter asked all of the company's supporters to stand during the meeting, nearly everyone in the audience got to their feet. "I think this has been a great first step toward getting whiskey back here," said supporter Lon Eldridge as he filed out of the meeting. Hamilton County was home to 30 distilleries before they were shuttered in 1915, Ledbetter said. The county was left out of a 2009 bill that let counties decide for themselves whether to legalize liquor-making, but Ledbetter and Piersant have garnered a loyal and enthusiastic support base since they started Chattanooga Whiskey 13 months ago and started a social media campaign aimed at getting the law changed. Until then, Chattanooga Whiskey will continue to be made in Indiana. County commissioners can't change the law on their own, but could ask state lawmakers for the change. It would take six of the nine commissioners approving the request for the letter to be sent. At the commission, Piersant and Ledbetter outlined potential jobs and economic gains a whiskey distillery could bring the county. Chattanooga Whiskey could start with 10 employees making $35,000 per year, Piersant estimated, and could initially net the county about $78,000 in property and sales taxes. He said the company is eyeing a renovated building on Chattanooga's Southside where it could make retail sales to locals and tourists. "This is not just about Chattanooga Whiskey," Commissioner Joe Graham said. "Looking at this thing as an economic tool, whiskey is already being consumed here no matter what brand it is. Whiskey is already being sold here no matter what brand it is. I do think it's a great novel idea to have our name on the bottle." Commissioner Warren Mackey also voiced support for the company, saying afterwards that the commission should be cautious about "legislating morality." "Would we stop making Volkswagens because people could potentially be harmed in the usage of them? Absolutely not," he said. Commission Chairman Larry Henry said that a letter would be prepared for next Wednesday's commission meeting. Mark West, the Chattanooga Tea Party leader, said the issue is "moral and ethical" rather than economic. "What message are we sending to our community, our younger more impressionable minds? Are we not communicating to them that the almighty dollar trumps all?" asked West. Ledbetter and Piersant said they respected and even agreed with West's concerns, while still advocating for the good a distillery could do. "It's actually a very respectable business," said Piersant, who added, "I absolutely believe you should vote the way your heart says to vote. I'm never going to disagree with that."